Dr. Robert W. Sadowski is a member of the Scientific and Professional (ST) cadre of the Senior Executive Service and serves as the Robotics Senior Research Scientist within the Research, Technology and Integration Directorate at the US Army Tank Automotive Research, Development and Engineering Center (TARDEC) in Warren, MI. Recently selected to this position after a long career within the Army culminating as an Academy Professor and Electrical Engineering Program Director in the Department of Electrical Engineering and Computer Science at the United States Military Academy where he was instrumental in developing the Academy's robotics program, facilities, and outreach. He also has over forty months of operational experience in Southwest Asia in a variety of leadership, staff, and engineering positions including Iraq and recently Afghanistan. 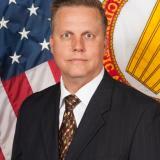 Bob is a graduate of US Military Academy with a BSEE and received his M.S. and Ph.D. in electrical engineering from Stanford University as a Fannie and John Hertz Fellow. He also holds a Masters in Strategic Studies from the US Army War College.